This lesson teaches how to divide fractions by whole numbers (sharing divisions) using mental math. We use the analogy of dividing pie pieces evenly among a certain number of people. In the video, I explain two different division situations where we don't have to use the "rule" or shortcut for fraction division, but instead can use mental math. The first is when a fraction is divided by a whole number. The second is when the answer to a fraction division is a whole number. First, let’s divide pieces of pie evenly among a certain number of people. This means that we divide a fraction by a whole number. 5 of a pie is divided among two people. 10 is divided among three people. Note how we can check each division by multiplication! 1. Color each person’s share with a different color, and write a division sentence. 6 of a pie is divided among four people. 5 of a pie is divided among three people. 9 of a pie is divided between two people. 10 of a pie is divided among three people. 12 of a pie is divided among three people. 20 of a pie is divided among five people. 2. Write a division sentence for each problem and solve it. and three people share it equally. How much does each one get? Next, we divide unit fractions—fractions like 1/2, 1/3, 1/5, 1/8, 1/12, and so on (of the form 1/n). Each person gets 1/8 of it. One-fifth is divided among three people. uncolored) into three new parts. sentence to check your division. a. Divide between two people. b. Divide between two people. c. Divide between two people. d. Divide between two people. e. Divide among five people. f. Divide among four people. g. Divide among four people. h. Divide among three people. i. Divide among three people.
. Multiply the denominator of the unit fraction by the divisor to get the new denominator. 5. Three children share 1/4 lb of chocolate equally. a. How much does each one get, in pounds? 6. A half a liter of juice is poured evenly into five glasses. a. How much juice is in each glass, measured in liters? b. How many milliliters of juice is in each glass? each beaker has, in cups. how much oil would be in each beaker? 9. Solve the opposite problem: if each person got this much pie, how much was there originally? 10. Write a story problem to match each division, and solve. 11. One morning, Joshua's gasoline container was only 1/8 full. He poured half of it into his lawnmower. a. How full is the gasoline container now? b. If the container holds 3 gallons, what is the amount of gasoline left, in gallons? Lastly, we will divide multiple leftover pie pieces among a certain number of people. This is a bit trickier, but I think you can do it! person gets 1/4 and 1/8. the 3/4 into 6/8, and then we can divide evenly by 2. 12. The leftover pie is divided equally. How much does each person get? Write a division sentence. a. Divide 5/6 between two people. First, split each piece into 2 new ones. b. Divide 2/3 among three people. First, split each piece into 3 new ones. c. Divide 2/3 among four people. d. Divide 3/4 among four people. e. Divide 2/5 among three people. 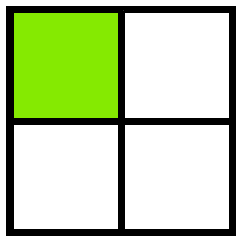 First, split each piece into 3.
f. Divide 4/5 among three people. This lesson is taken from Maria Miller's book Math Mammoth Fractions 2, and posted at www.HomeschoolMath.net with permission from the author. Copyright © Maria Miller. 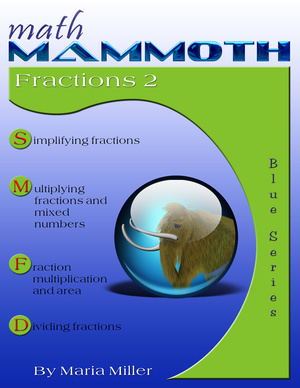 A self-teaching worktext that teaches fractions using visual models, a sequel to Math Mammoth Fractions 1. The book covers simplifying fractions, multiplication and division of fractions and mixed numbers, converting fractions to decimals, and ratios. Download ($5.75). Also available as a printed copy.